This recipe comes from a friend whose family makes these for Christmas every year. 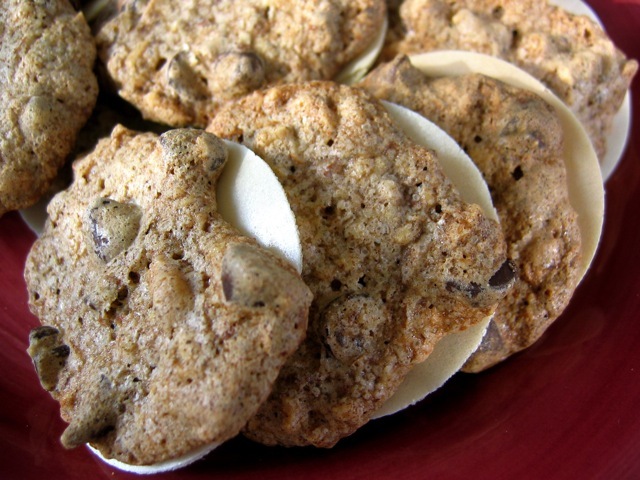 They're basically chocolate-nut-spice-fruit drop cookies baked on edible wafers. Try not to let the cookie dough spread past the wafers when you're assembling them before baking; you want the wafer to show in a ring around each mound of dough. Beat the eggs until frothy and pale yellow. Add the sugars, flour, baking powder, and spices; mix well. Add the nuts, chocolate, and dried fruit. Arrange the Backoblaten wafers across the prepared cookie sheets. Drop a heaping teaspoonful of cookie dough onto the middle of each wafer. Bake for 12 to 14 minutes, rotating the sheets halfway through the cooking time. Let cool briefly before removing to a rack to cool fully. Repeat until all the batter is gone. The edible wafers known as Backoblaten are available at European import stores or online at the German Deli. Get the 50-millimeter size. These cookies will keep for at least two weeks if stored in a covered cookie jar.